But oh it’s the pudding that really matters to me. Frankly, cooking a turkey and the myriad of traditional accompaniments is such a mission each year that I barely taste it. I may mutter the mantra ‘it’s no different to Sunday lunch’ a thousand times to myself between the hours of one and three on Christmas Day but I’m not fooling anyone. The stakes are different – this is Christmas, no-one’s going to cut me any slack, and turkeys are a bugger to cook just right. But by the time we get to pudding I am starting to relax. The first glass of wine has slipped down, everyone has been politely complimentary about at least one component of the roast, and the main event – the Christmas pudding – is about to arrive on the table. 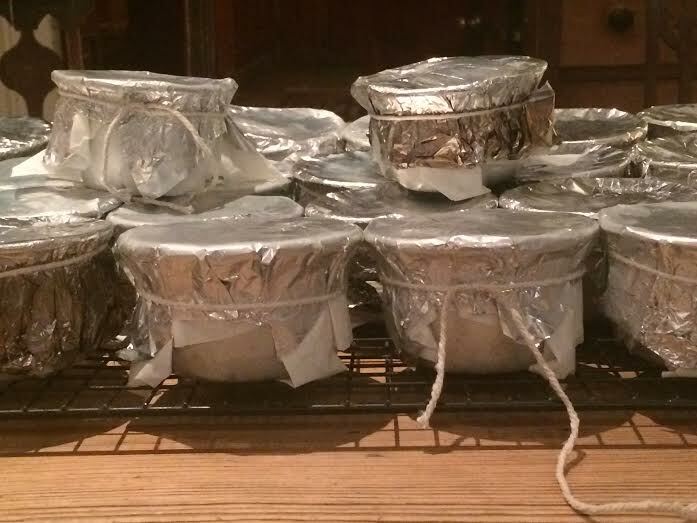 This autumn I had a moment of madness and volunteered to make the Ox Christmas puddings along with my own. It would just be multiplying the quantities of everything, I reasoned, and since the food processor does most of the chopping of the raisins and the sultanas and the apricots and nuts I didn’t think those 150 dinky little puddings would be too much work. I offered to bring one into the kitchen for Head Chef Mike to test. It was to be Bake-Off with a competitor of one. Naturally enough, he gave me the full Paul Hollywood treatment – the digging in of the spoon, the serious face, the long long pause to consider. But he liked it! He liked it very much! Mary might have cried had she been there. Then as he smiled I remembered in that very moment that every single miniature silvery steaming bowl would need to be individually greased and wrapped and foiled and tied with string before steaming, then each pudding cooled and unwrapped and rewrapped in more paper and foil after steaming. I remembered the crushing and dehusking of a hundred or more cardamom pods and the pounding of many tablespoons of cloves in the pestle and mortar. I remembered the loaves of brown bread I would need to bake and the almonds I would need to whizz for the almond macaroons. But I smiled nonetheless because I knew that Mel and Sue would have wanted me to. They are finally all done and they have been made with as much Jevington Place Farm as I can get into them. The raisins, apricots and sultanas and spices come from… well, the supermarket. (The man on the third till nearest the lift is keeping a tally on the number of times I nip in for a crazy amount of raisins.) But the apples come from the farm, Jonny’s granny has provided her superlative homemade marmalade, and, of course, the eggs are Ted’s finest.